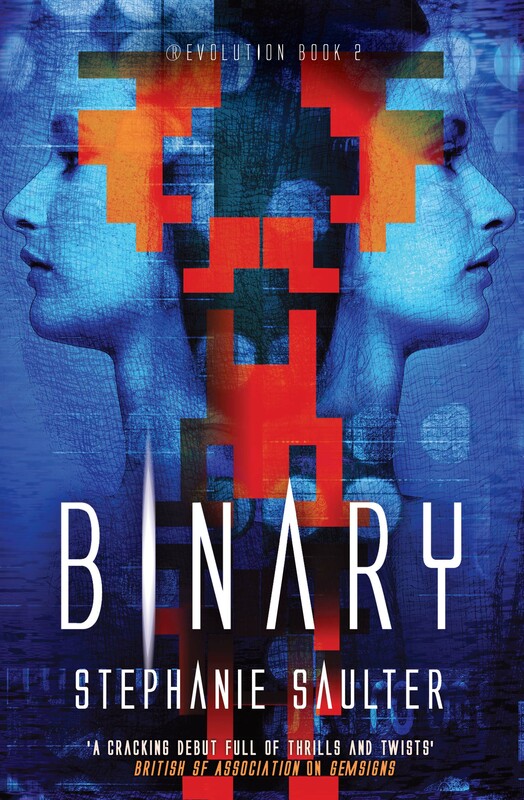 Binary is now out in North America, which officially makes it available throughout the English-speaking world. Accordingly it and I are popping up all over the place, like some kind of brightly-jacketed internet mushroom. I’m really proud of this book; it’s the first thing I wrote after I’d got a publishing deal, when I knew I was a proper writer and also knew that meant I had something to prove. I poured my heart and soul into Binary, and I believe it shows. But! This is not where I tell you what I think of my own work, because I want you all to go read it and have your own thoughts. I will, however, share some other things I’ve written recently to mark the US hardback and the UK paperback releases. They are all in one way or another about the opportunities and the responsibilities of being a storyteller: tackling an unplanned sequel, creating fictional worlds that nevertheless reflect reality, the kinds of stories we choose to keep telling, the challenge of conveying character and of finding your own voice as a writer. What happens now? Given what has already been done, and cannot be undone; knowing what we now know, and can no longer pretend ignorance of; how do people move forward? What kind of society do they wish to live in? Who will they choose, now, to be? Thanks to medicine, it is a certainty that no one anywhere in the world will get smallpox ever again. That is a real-life, honest-to-god miracle, accomplished during my lifetime; but there is no glamour attached to it. The fairy dust of fictional extrapolation has somehow passed it by. As someone who writes fiction which draws on the social sciences as well as on genetics and information technology, I’m keenly aware of those patterns of belief and presumption – and given that fiction almost invariably relies on some kind of conflict to provide a sense of significance and urgency, it strikes me that how we resolve fictional conflicts is relevant to how we think about real ones. If creating this plethora of voices and characters and languages and subtext sounds terribly difficult and complicated, well it is – but no more so than the complex human interactions we engage in and expertly negotiate every day. 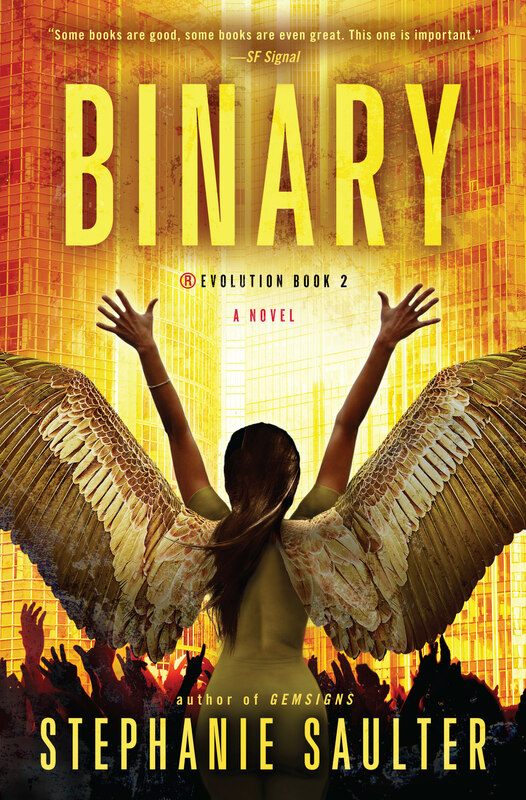 BINARY: US Edition Cover Reveal! 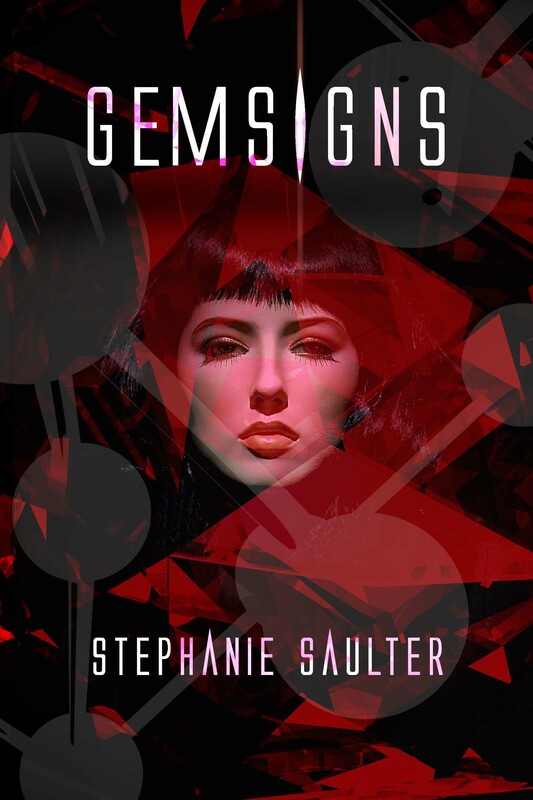 When confiscated genestock is stolen out of secure government quarantine, DI Sharon Varsi finds herself on the biggest case of her career: chasing down a clever thief, a mysterious hacker, and the threat of new, black-market gemtech. Zavcka Klist, ruthless industrial enforcer, has reinvented herself. Now the head of Bel’Natur, she wants gem celebrity Aryel Morningstar’s blessing for the company’s revival of infotech – the science that spawned the Syndrome, nearly destroyed mankind and led to the creation of the gems. With illness in her own family that only a gemtech can cure, Aryel’s in no position to refuse. As the infotech program inches toward a breakthrough, Sharon’s investigations lead ever closer to the dark heart of Bel’Natur, the secrets of Aryel Morningstar’s past … and what Zavcka Klist is really after. The US hardback is in stores on May 5th, and I shall be popping up in various places online in celebration. Thanks to mine hosts! Back to the delightful image of Andrea and Aryel shooting the breeze over a beer: I was reading SF Signal’s MIND MELD posts because I’ve been asked to participate, so look out for me popping up there to talk about a life-changing book sometime in the next week or so. I’ve also written an essay on damaging narratives for Fantasy Cafe’s Women in SF&F month, which I’m told will be posted on 19th April. My contribution to the Special Needs in Strange Worlds column on SF Signal is likely to go up on 6th May. And I’ve been opining on superpowers and social media, as well as doing a couple of interviews, all of which will appear online in the next few weeks, and will be linked under Press + Posts above. We are a split and splintered species. Every pivot-point of need and creed proves the ease with which we fracture; every heartfelt reunion warns against its own necessity. The lines of our division are as many and varied as the sins of our ancestors and the accidents of history; as varied as the lines on the palm of Mikal Varsi’s hand, double-thumbed and huge at the end of a three-foot-long arm, as he raises it and takes the oath. His eyes, split-lidded like a lizard’s, blink slowly as he listens to the solemn proclamation of the clerk, stumbling over her words a little as she gazes up and up to his face, wondering as she does so if her tiny part in this moment will be remembered; and wondering also, fleetingly and with guilt, whether posterity will smile upon the memory, or revile her for it. Then he opens his mouth, an ordinary mouth, a mouth she has already learned is no less quick with smiles than with wit, and in a gentle, nasal voice repeats after her just as he should, and she thinks, Well that wasn’t so bad. She turns to set aside the edicts he has sworn to uphold, and he turns aside to the woman who stands behind him, a woman whose height and hands and eyes are steadfastly normal and who would, moreover, tell you that her heart is too; though there are still many who think this unlikely, for she has given both it and her name to a gem, a man designed for service and built for labour. He bends now and the long arm wraps around her body, and the thumbs on either side of that well-lined palm squeeze her shoulder as she tips her head back to smile up at him and receive his kiss. There is applause from his fellow councillors and hearty laughter all round the chamber, but the clerk thinks she sees a hint of her own secret worry flit across more than a few faces. And then he steps off the platform, eight towering feet of genetically modified humanity moving to take its place for the first time among the elect of the city; and they part for him like a sea, and like the sea close behind him once again. It’s Binary’s birthday! My second novel and the sequel to Gemsigns is now out in the UK. 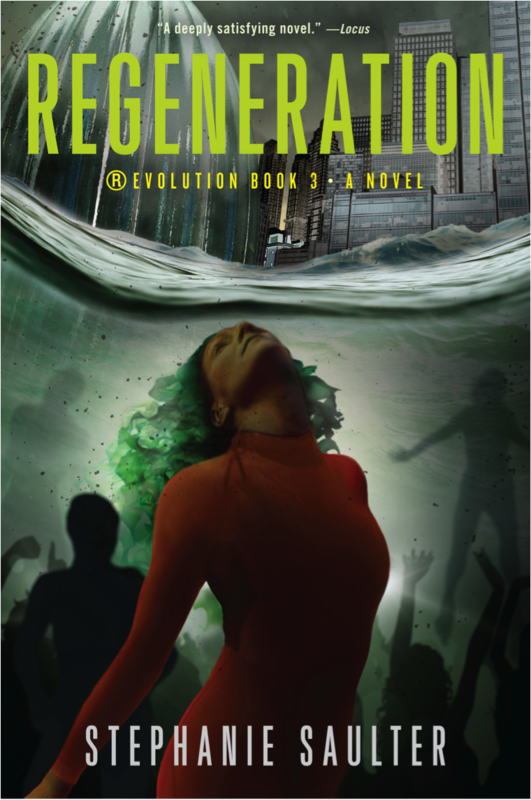 Lisa McCurrach calls it ‘another five-star effort,’ and in her interview with me for SF Signal, Andrea Johnson asked me to describe a favourite scene. This is the first of the two that I mentioned, and is the opening passage of the book. I hope you like it. There’s only a week to go before Binary is published, and the Gemsigns paperback edition comes out, and as threatened promised I am popping up all over the internet. In addition to the Civilian Reader and Jo Fletcher Books guest posts, and great reviews of both books from Lisa McCurrach and Sarah Chorn (all linked from here), there’s been an interview with Andrea Johnson and another guest post, about dystopia versus democracy, both on SF Signal. Plus I’ve had more superb reactions to Binary via Twitter from other respected reviewers, and there are more posts and interviews lined up. If you’re inclined to online purchasing, you’ve got a lot of options. The cover images to the right will take you directly to the Amazon UK pages for Gemsigns and Binary, and if you’re a Kindle user you’ll know they are the only source for your ereader as well as being a place to buy print. You can also purchase directly from the publisher, Jo Fletcher Books, who will have the epub as well as print copies available; and of course if you’re an Apple user you’ll know your way around iBooks. The Book Depository doesn’t do ebooks (as far as I can tell), but they offer good prices on print and – best of all – free worldwide delivery. And there are many other sites through which both print and ebooks can be ordered; if you’ve got a favourite that I haven’t mentioned, feel free to link it in the comments. But here’s the thing about bookshops large and small that I think customers often don’t realise: you can always order what you want from them right there at the till. The store will have it delivered, and you can collect it at your leisure. I’ve had too many people say to me, frustratingly, that they looked around their local bookshop, couldn’t find my book, and left without further inquiry. If you’ve been following the very fraught issue of the (under)representation of female science fiction and fantasy authors (as well as authors of colour, books in translation, non-heteronormative perspectives and anything else that’s not white, Anglo-American, male and straight), you’ll know we already have a mountain to climb when it comes to getting shelf space in bookshops; not to mention front-of-house table space. Progress is being made on this last point, as reported by Emma Newman and indicated by Foyles’ assurances to Sophia McDougall, and I am delighted by that. But when a book isn’t in the store to begin with, interacting with the staff and placing an order through them is another small, simple, non-confrontational action that anyone can take and that quietly helps to redress the imbalance; purely as a side effect of getting you the book that you want while giving them the sales that they need. That’s because it does two things. First, it makes the booksellers – the people who actually interact with and make recommendations to the public – aware of a book they might not otherwise have even known existed. Verbalising information makes it sticky; they’ll remember that they took a customer’s order for such-and-such a book. Second, it creates data that pings back to head office (assuming you’re dealing with a shop large enough to have one), and tells them what said public is walking into their stores and asking for. It creates a contradiction to the narrative that keeps the book from being on the shelf in the first place: the trope that it’s not worth carrying in-store because it won’t sell. This is usually difficult to refute in sales terms, because standard practice makes it circular and self-fulfilling; and bookshops are under such tremendous pressure in today’s market that simply haranguing them to take what they perceive as a commercial risk is likewise a difficult ask. It’ll only become less difficult as it’s perceived as less risky. So if you’re inclined to shop in-store instead of (or in addition to) online, and you don’t see what you’re looking for, do me and your other missing author(s) a favour. Don’t assume that the shop has just sold out (that would be lovely), or that they’ll have more copies in next week (not likely). Make the inquiry. Order the book. That will let them know there is a demand, and nudge at that damaging narrative. My book birthday is in a week. It’s the best present I could get. *Who I don’t think will have Binary in print for a while, as they only carry mass-market paperbacks and the Binary MMP won’t be out for a year. Will I ever turn into one of those writers who ‘never reads the reviews’? Not as long as they’re like this. Coming soon: Transatlantic Pre-Publication Promotional Frenzy. Also: new home! Success is its own reward, or perhaps its own punishment. Since I last mused about story-writing, I’ve done anything but. I barely put fingers to keyboard for the past week, while I moved out of the friend’s flat I’ve been sharing for the past few months and into one of my own. I can remember when this wouldn’t have required more than a half-day or so of unpacking and sorting, but in the years since then I have accumulated a truly astonishing amount of Stuff. And if you think fitting the contents of a rambling three-storey barn conversion into the compactness that is a London flat sounds like a challenge, well, you’d be right. But it’s done and I’m in; pictures are up on the walls and books, most importantly, are back on the shelves. And not a moment too soon: I’ve got lots of lovely people asking me to do lots of writerly stuff, all due to the fact that I have two books coming out in the next two months. One of which is already out. Confused? Bear with me. 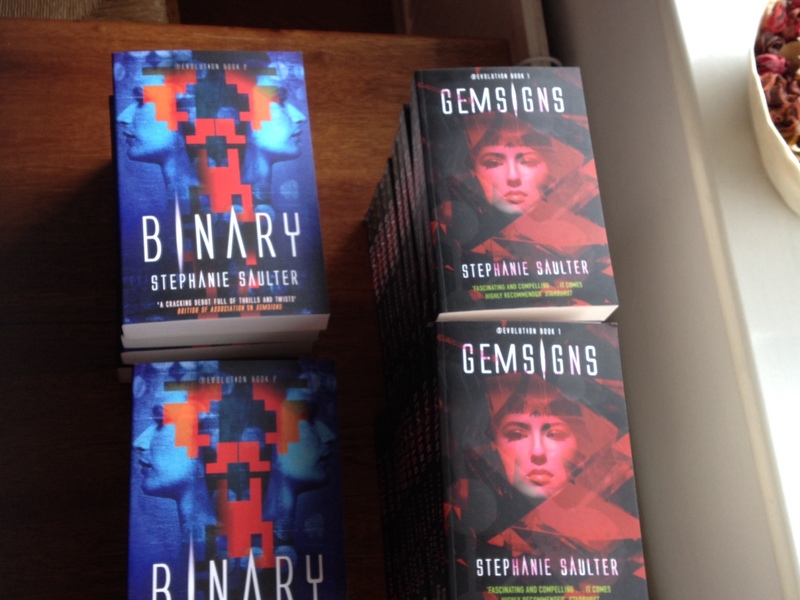 Binary drops in the UK and Commonwealth on 3rd April*, and Gemsigns gets its North American release in May. And because the Americans need things Americanised, that meant I had the American copy edit, and then typeset, to review in February; not to mention different cover art to comment on and cover copy to check. Welcome to the wonderful world of global publishing. As you might suspect, all of this means there’s going to be just a wee bit of a promotional jamboree happening over the next month or three. I’ll be cropping up in various places online, on both sides of the pond (and in May I cross the pond for real, to read at the Calabash Literary Festival). I’ll post links here to stuff happening elsewhere, and there’ll be some bespoke writing for this site as well; but the growing list of interview and guest post requests makes me think that much of what I planned to talk about on my own blog will turn into conversations in other locations. I’ll put up the signposts, and I hope you’ll join in. *Note to reviewers: Binary is available on NetGalley for another week. I did an interview this week with Jasper de Joode of The Book Plank (another blogger from The Netherlands, a country that seems to like Gemsigns a lot). 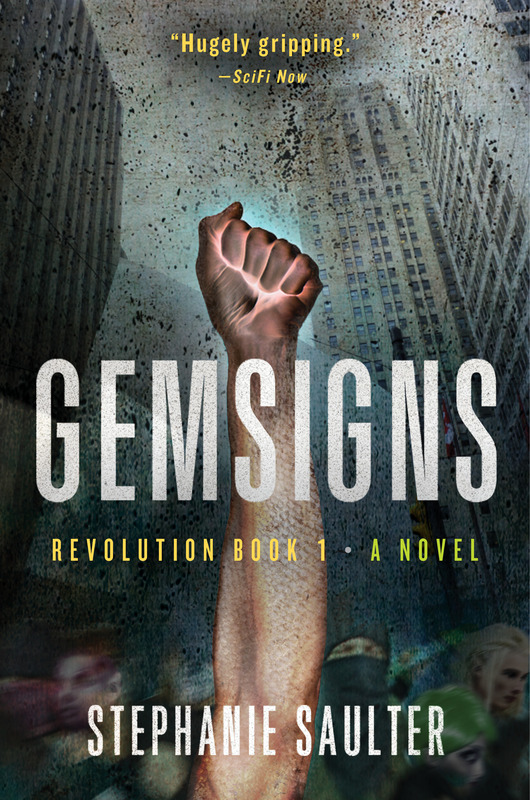 He asked the kind of questions that made me hold forth on the thematic underpinnings and technical challenges of my books – I ramble on about both Gemsigns and Binary. You can read that here.